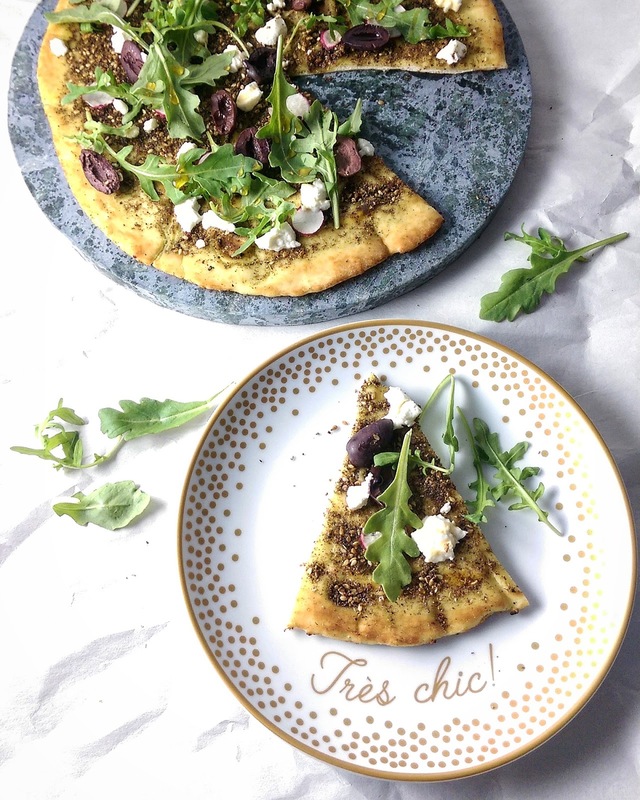 The idea of za'atar pizza came to me one evening when I was craving both a pizza and a za'atar. I opted at first for za'atar, as it's faster, it was late, and I was feeling rather lazy. I mean, Wednesday night at 7pm isn't exactly the optimal time to start making a pizza dough, you know? I looked over at my package of already made pitas, and glanced at my beautiful pizza stone. Queue overhead lightbulb! That was the moment that Za'atar Pita Pizza was born. The idea is quite simple, perfect for a quick weeknight dinner. Minimal prep, minimal clean up. Spread on the za'atar, chop up a couple of veggies, crumble some goat cheese, set my pita on a pizza stone and heat it up until the toppings are nice and warm and the cheese is melty. Homemade delicious pizza, with mediterranean flair, in less time than it takes for delivery? Sold! This works best with a thick pita bread (also called pitta, or flatbread depending on where you live!) The ones that I buy are either called lebanese-style or greek-style. The paper-thin "regular" pitas don't work as well as they end up getting quite brittle and then soggy in the middle. If you can't find specialty pita, na'an bread will work equally well. You can easily find na'an at any Provigo/Loblaws/City Market if you're in Canada, or at Trader Joe's if you're in the U.S.
Feel free to mix and match your toppings. I like olives & radishes on mine, but maybe you prefer bell peppers & onions. Use what you have on hand - keep it simple and easy! LOVE sumac & za'atar? 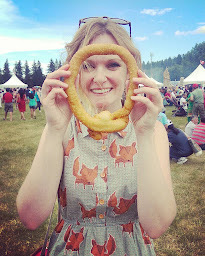 Check out some of my other deliciously sumac-y recipes. Preheat oven to 375F. Combine za'atar spice mix and olive oil in small bowl. Spread evenly onto pita breads. Top with all toppings except for arugula. Place on parchment-lined baking sheet (or on preheated pizza stone, if you wanna get all fancy up in here). Bake for 10 to 12 minutes, until cheese begins to melt and crust begins to turn golden. Remove from oven, top with arugula & serve hot. 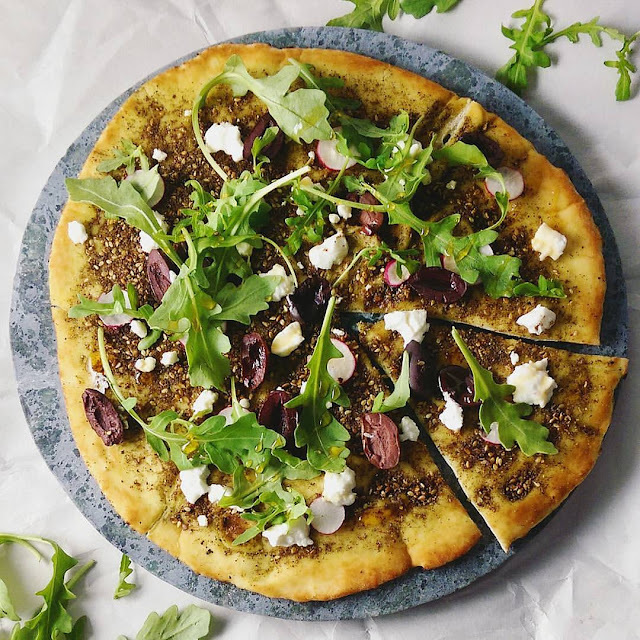 Za'atar pizza looks so yummy, it really arouse my motives of trying outr something new.Now that i have the ingredients i will give it a try, thanks for this post.